Y'all, I thoroughly enjoyed this book. I've been a big fan of She Reads Truth for a few years now. 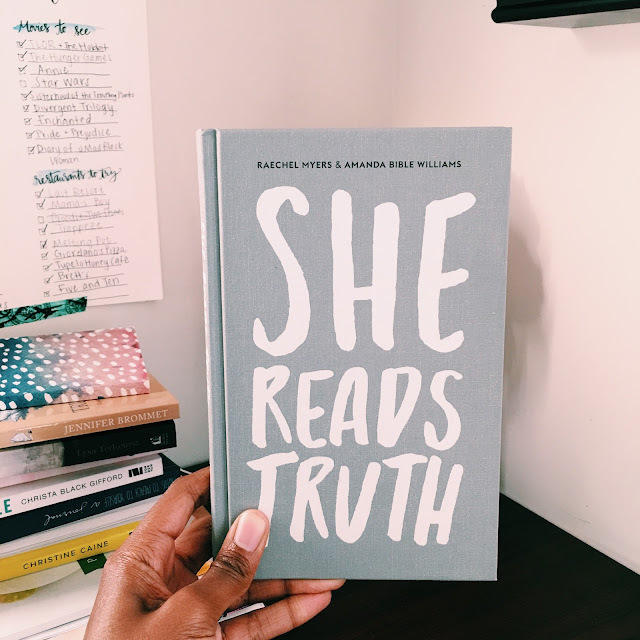 She Reads Truth started as a movement of women came together and decided (with the use of a clever hashtag) that they wanted to be in the word of God every single day. The movement became an online community, and is now also a free app and online store with amazing resources. Raechel Myers and Amanda Bible Williams are the town women who are behind this movement, steering its ship and watching where the Lord leads as they discover new ways to engage women in the word of God as they see life transformation happen when they dig deep into the pages of His good and mighty word. I love a good memoir, and this book was just that. But what's special about this book is that it is not just one person's story. And it's not two, even though there are two wonderfully talented authors. What's special about this book is that it is my story, and it is your story. The subtitle for this book is "Holding Tight to Permanent in a World That's Passing Away." Raechel and Amanda both beautifully and vulnerably share their stories of loss, grief, trials, and sorrow in the hopes that we will see and understand that we have a God is sovereign, kind, sweet, and wonderful in the midst of each and every moment. He sees our pain, and He knows our stories, in fact, He's the author of them. And He only writes stories for His glory and our good. Paul knew truth-adjacent would be appealing. Even now we want new teachers and fresh truths- we want a gospel that depends on us, at least a little...Truth-adjacent is everywhere. Something may sound and even look a lot like Truth. But Paul warned us then and we get to remind each other now: if we are hanging our hat on something that points us away from our need for Jesus, it is not true. Salvation because we're walking the line is gospel-adjacent. Salvation because we cannot do what Christ has done is gospel. Peace because we've stripped back our busyness, simplified our schedules, and picked our yeses and nos carefully is truth-adjacent. Peace because God's Word is an anchor for our souls no matter how simple or messy our lives look is truth. This. THIS is why we read Truth. Y'all, I want that kind of peace. I've definitely experienced truth-adjacent peace as a result of my own striving to "make things better." But I want that peace that flows like a river through my soul, inviting me to rest in Jesus Christ alone. I want it so badly. And I am ever so grateful for the women who so bravely wrote this book, which invites us to pursue that peace through knowing Him more through the power of His never-failing and unchanging word, which is permanent and unfading.